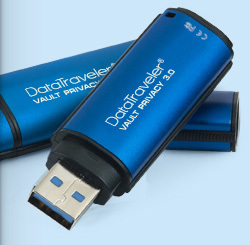 Kingston’s DataTraveler® Vault Privacy 3.0 USB Flash drive provides affordable business-grade security with 256-bit AES hardware-based encryption in XTS mode. It protects 100 percent of data stored and enforces complex password protection with minimum characteristics to prevent unauthorized access. For additional peace of mind, the drive locks down and reformats after 10 intrusion attempts. It also features a read-only access mode (enabled via SafeConsole for the Managed model) to avoid potential malware risks. SuperSpeed USB 3.0 technology means users don’t have to compromise transfer speeds for security. DTVP 3.0 is FIPS 197 certified and TAA compliant, to meet frequently requested corporate and government IT requirements.